A touch of red, in Athens. Athens observes the orthodox Good Friday! Today is Friday, April 26th, 2019! The Greek-Orthodox world observes the Holy Week, the week preceding Easter. On Good Friday, Orthodox Christians commemorate the time when Jesus died on the cross. During the afternoon services, Jesus is taken off the cross and laid in the tomb (Epitaphios). During the evening service, the believers mourn his death, read Bible passages, and sing hymns. Later, the priest and those who serve in the altar make a procession around the church. Most churches actually take the Epitaphios outside of the church and make a procession around the neighborhood. In many parishes, girls throw rose petals on Jesus’ body. This procession represents Jesus entering Hades. Temperatures in Athens will range today in the mid to upper 60°s F, under partly sunny skies. But, be happy and don't worry! Wear your carefree mood, wander around in the Athenian neighborhoods, visit some of the many museums or the several archaeological sites worth paying a visit to, enjoy the aroma of a cup of coffee or a refreshing drink in one of the several coffee shops that line the Athenian streets, or better still, taste the delicious and healthy Greek cuisine. Kalimera from Greece! As of 4/9/2019 the US State Dept. raised the travel advisory level for Turkey to 3, urging Americans to “reconsider travel to Turkey due to terrorism and arbitrary detentions.” “Security forces have detained tens of thousands of individuals, including US citizens, for alleged affiliations with terrorist organizations based on scant or secret evidence and grounds that appear to be politically motivated,” the advisory says. “US citizens have also been subject to travel bans that prevent them from departing Turkey. Participation in demonstrations not explicitly approved by the government of Turkey, as well as criticism of the government, including on social media, can result in arrest,” it adds. It also warned of terrorist attacks in tourist locations, transportation hubs and other public areas. The advisory is one grade lower that the “Do not travel” level. Welcome to The Athens Key! The Athens Key is a travel companion for Athens and all things Greek, in English. It is designed for the potential visitor to our hometown, or for the curious mind. From the research to the text to most photographs, we strive to highlight the most interesting landmarks of this historic city worth seeing, but also some of the lesser known, quaint, yet ever so intriguing, attractions of our city. We tirelessly look for, and suggest, places, events, services, shops, museum shows, curiosities in Athens, as if a friend from abroad was about to visit for a short stay and was asking for our advise on how to best plan their visit. ​​For decades now and up until recently, during the official ceremony of welcoming a foreign dignitary, the Mayor of Athens would hand them the Golden Key of Athens in a well-staged photo opportunity. It used to be a somewhat exaggerated gesture in recognition of a goodwill visit and signified that the guest would always be welcome back to the city as a friend. Well, we ran out of gold, and our city is now in need. But, as citizens of Athens who love our hometown and have nothing to gain from sharing this love, to you who dropped by, we decided to offer you The Athens Key, without the hoopla and the decorum, but from the bottom of our heart! ​We should note here that we are not supported from, or financially aided by any official or unofficial state or local government, we have no ties or affiliations with any enterprise that could possibly influence our opinion or alter our objectivity. At the same time, we can not and do not claim to have included all that is worth seeing in Athens, nor that our coverage of the subjects is complete. Thus, we strive to improve, to keep an open mind, to be informed, and to constantly add material to The Athens Key. Enjoy! Athens: A Hot City that is always a Cool Destination! ​In 2018, the city of Athens was named World Book Capital, chosen by ​UNESCO for the quality of its activities, supported by the entire book industry. The program included meetings with writers, translators and illustrators, concerts, thematic exhibitions, poetry readings and workshops for publishing professionals and aims to make books accessible to the city’s entire population, including migrants and refugees. Members of the Advisory Committee also praised Athens’ cultural infrastructure and its expertise in organizing international events. Similarly, Athens was awarded the 2018 European Capital of Innovation Award at Web Summit, Lisbon, Portugal. This is an annual cash prize of € 1 m. awarded to the European city that is best able to demonstrate its ability to harness innovation to improve the lives of its citizens. Recent years have seen a surge of art galleries, collectives and nonprofit art organizations built for leaner times. The Stavros Niarchos Foundation Cultural Center, designed by world-renowned architect Renzo Piano, is now fully functional, and has fast become a cultural beacon for the Greek capital. Athens was 7th Best European Destination for 2018, in online polls conducted by the European Best Destinations organization, whose purpose is the promotion of culture and tourism in Europe, and works alongside with the biggest tour operators in Europe covering 355 destinations. Ever since its participation in this competition, Athens has ranked among the top most favorite destinations of travelers worldwide. With a recorded history of 3,500 years, the Greek capital is constantly undergoing urban renewals to keep up with the evolution of time. Athens lives up to all the hype! The Stavros Niarchos Foundation Cultural Center. ​Crete is TUI’s top holiday destination for European travelers this year, and Greece is the second country of choice after Spain, according to the holiday bookings made through the largest leisure, travel and tourism company in the world. According to TUI, vacationers from Europe this year rank Greece’ largest island Crete first in the destination list. Three of the five most popular destinations for Germans are found in Greece: Crete, Rhodes and Kos. Greece is also very popular among Northern Europeans. For Norwegians, Swedes, Danes and Finns, Greece is the number one holiday destination. ​The Greek islands topped the list of the 20 “Best Islands / Favorite Islands in the World”, as voted by the readers of prestigious Condé Nast Traveller 21st Annual Readers’ Awards 2018, due to their “extraordinary scenery and people.” To top it off, Greece was voted as the “Best Country in the World” by the readers of CNT. The readers of the luxury travel magazine voted for what they love most about travelling, including favorite countries, cities, islands, ski resorts; top hotels and spas; best airlines, airports, cruise lines, villa rentals and tour operators. You can always plan your travel or vacations in Greece on your own, relying on your experience and the advice of friends or trusted sources, including The Athens Key. This way, you will enjoy the absolute independence, make best use of your financial resources and utilize every single day according to your own interests and needs. Alternatively, enjoy a luxury all inclusive Europe holiday with no hassle whatsoever when you travel with Club Med. Check Hotels in Athens and all over Greece by using the reliable search and booking engines of Booking.com, or browse through each and any of our pages and rely on the accommodation suggestions we offer close to most places of attraction. ​ Plus, if you are a property owner anywhere in Greece, list your place with Booking.com, and pay no commission on your first five bookings! Any type of property is eligible, whether it’s a home, apartment or hotel, and anything in between. Before a property gets listed, it needs to go through Booking.com’s standard verification checks. ​​For the best prices and availability among the most reputable car rental companies worldwide, including car rental and pre-booked taxi services, visit Rentalcars, the ground transport team of Booking.com. Choose among several schedules, destinations, dates and offers among the luxurious and reliable cruises to leisurely explore the Mediterranean Sea! Look for special deals! Please note Destinations including select places you'd visit on an excursion from Athens, accessible by land or sea. Some are popular with most cruises to the Eastern Mediterranean and certainly accessible by the sailing boat or motor-yacht you may charter! Corfu, Heraklion, Mykonos, Rhodes or Santorini by sea, or Delphi, Epidavros, Olympia or Marathon by land, a multitude of destinations await your selection! Greece is the birthplace of the Mediterranean Diet, the balanced diet that keeps you healthy and gives you a long life. A delicious cuisine, which comes as a combination of indigenous, ancient practices and recipes, along with hundreds of Middle Eastern, Southern European and other influences resulting in a delicious tasty, hearty and healthy menu of choices. Check our FOOD section, and the pages under it, such as Bakeries, Farmers Markets, Juice Bars, Lunch or Dinner, Pastry Shops, Street Food, etc., and enjoy! Bon appetit! ​Are there excursions, for a few hours or a couple of days, organized or not, that one can take using Athens as a base of operations? Indeed, there are several Classical Tours available that might include Corinth, Epidavros, Mycenae, Olympia, and, of course, Delphi from Athens. Or maybe you want to try the Acropolis Walking Tour. For Tours and Activities in Athens and all over Greece, visit Viator now for an unforgettable trip! ​Save 20%! Athens Super Saver: City Sightseeing Tour plus Half-Day Cape Sounion Trip! Save 15%! 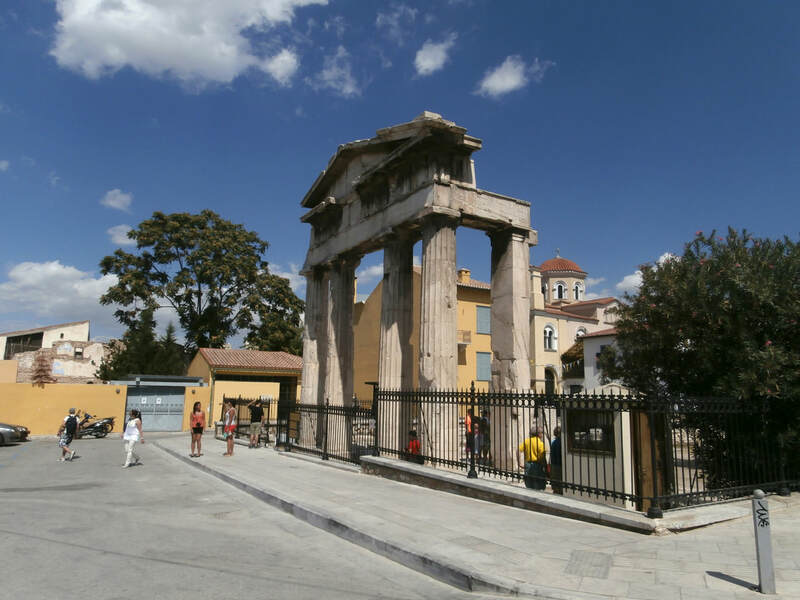 Classical Greece: 3-Day Tour​ from Athens. For ferries to the islands of the Greek Archipelago, book through our affiliate AFerry, the world's leading ferry website and the industry front-runner in booking technology, offering a simple way of easily booking ferry tickets online to make your way to Greek dream islands such as Santorini, Mykonos, Corfu, or Hydra. ​You may wish to search for and book a flight to Greece via Aegean Airlines, or within Greece via Aegean Airlines or Olympic Air, an Aegean Airlines subsidiary. Or a flight anywhere else in the world. Try kiwi for the beast airfare! For a line of products by Airportag, the best Aviation and Travel Gift Shop, on the Athens Airport check here! ​​Can one charter a motor-sailer, a motor yacht or a sailing boat, barefoot or with a skipper, to cruise the magnificent Aegean Archipelago or the green islands of the Ionian sea? Need we say yes? Visit our page Sailing & Yachting in Greece! The Temple of Hephaestos, Athens. The Gate of Athena Archegetis, entrance to the Roman Agora of Athens. Within the Resources of The Athens Key, take a look in the Basic Architectural Terminology as well as the 3 Orders of Architecture for better following the descriptions of the ancient temples but also the Byzantine churches. Also, a biography of the great romantic poet and philhellene Lord Byron. 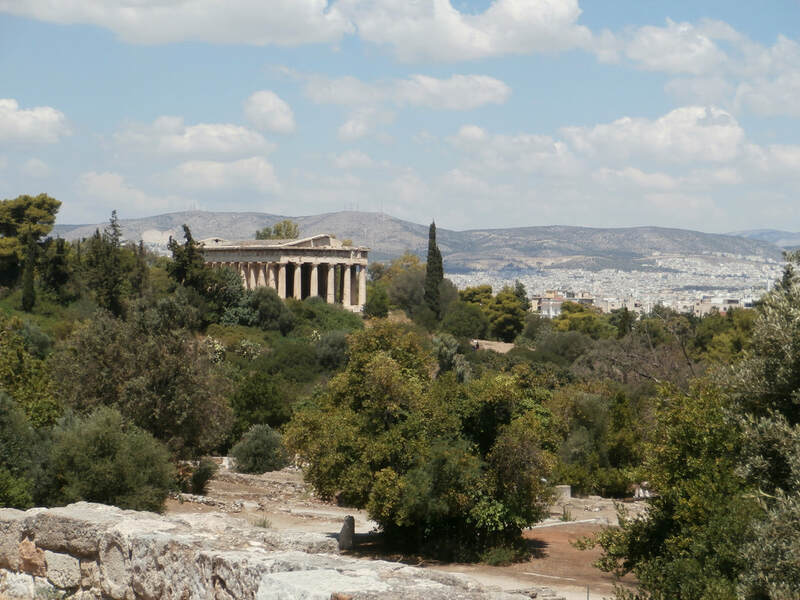 Check our Brief History of Athens, and the Greek Pantheon pages. They may remind you of key-facts that may be useful in better utilizing information that can be found throughout our website and during a potential visit to Athens. For a page full of travel resources, including links to flights to Greece or within Greece, hotel, villa, or home rentals, cruises, yachting and sailing, car rentals, tours and excursions, even travel insurance, visit this page, and you are half way to Athens already! Look for discriminating selections of Swimwear and Beachwear to wear this coming Summer on the gorgeous Greek beaches. And then, for the time of relaxation, check our Lingerie page. Checkout this page for Fashion ideas and here for Jewelry or Fragrances! For your indoor gym exercise but also for your outdoor sports activities check out our Activewear! 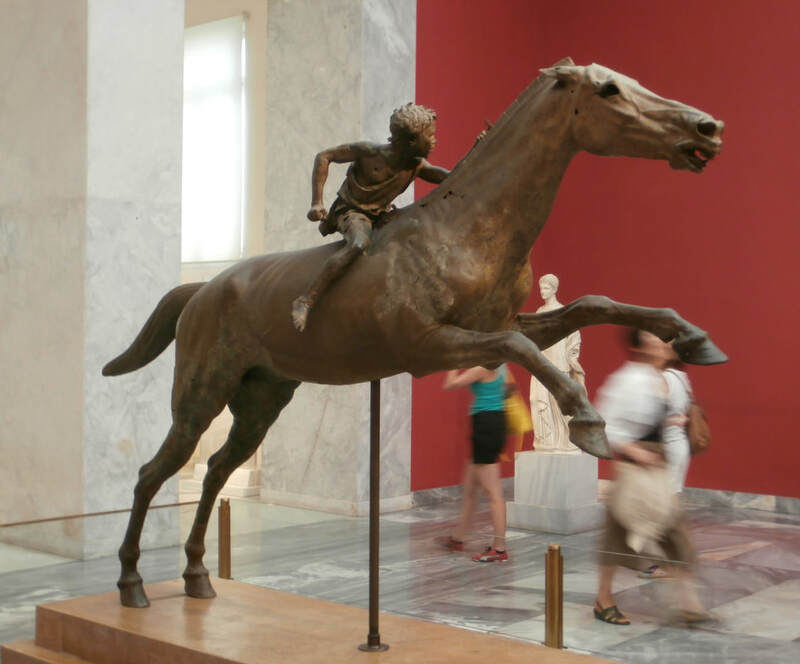 The Rider from Delphi, National Archaeological Museum, Athens. For a large selection of bags, suitcases and travel accessories, check Travel Luggage & Cabin Bags, who are passionate about bringing the finest quality, stylish yet lightweight luggage products from the world's largest manufacturers to their customers. in an unrivaled range, at the best prices. Do you prefer the Samsonite line of products? Visit ebags, their online store! Last, but not least, visit our Travel Insurance page. Allianz Travel Insurance - Travel The World Knowing You'll Be Taken Care Of. Affordable Plans As Low As $17. In our constant quest to improve and enhance the effectiveness of the Athens Key ​​we keep making additions and navigational changes here, within the technical limitations of the platform, and our own abilities. We hope you'll find the changes practical and effective, but, if not so, we would love to hear your input and suggestions!